As an admin, account admin, or manager, you can add live trainings to your Bridge account. Live trainings allow for training and other corporate activities away from an online environment. For instance, you may create a live training for a hands-on workshop or an off-site presentation. You can create sessions within live trainings to give all learners an opportunity attend the session that fits best with their schedules. On the Live Trainings page, you can view all live trainings in your account. 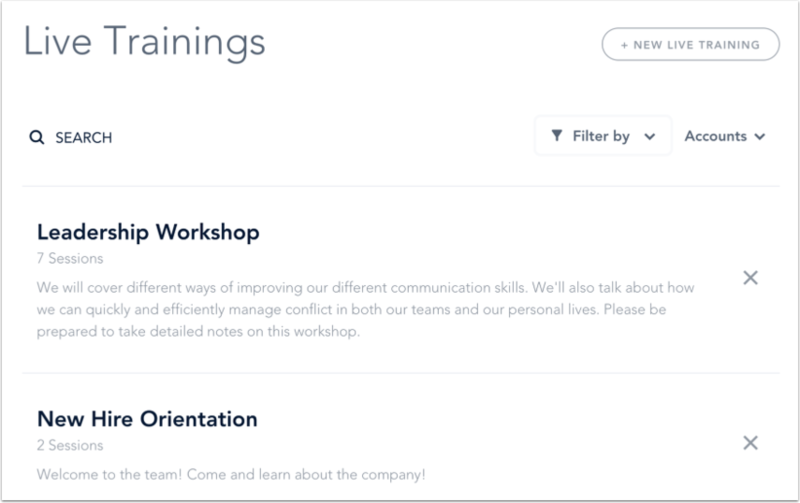 On the Live Trainings page, you can view the name of each live training , the number of sessions , and the description of the live training . The number of sessions includes both published and unpublished sessions. To view details for a live training, click the name of the training . To add a live training, click the Add New Live Training button . To delete a live training, locate the training and click the Remove icon . Previous Topic:How do I delete a group? Next Topic:How do I create a live training? Table of Contents > Manage Live Trainings > How do I use the Live Trainings page?